After being jailed twice for vending hot dogs without a permit, Steve Pruner of Outlaw Hot Dogs finally is permitted and back in business. 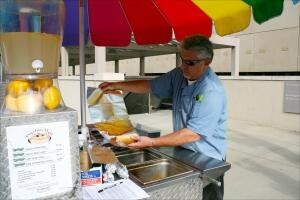 The Durham hot dog vendor operated for nine months without a city vending permit or a county health department permit. Pruner said he was willing to pay the $175 cost to get the permits, but had been unable to get a “commissary agreement,” a condition of the health permit. The North Carolina Department of Environment and Natural Resources requires all mobile food vendors to “work in conjunction with” a permitted restaurant or commissary. In other words, vendors are required to rent space in a health-inspected restaurant or commissary to prepare food, wash dishes, and store carts. Vendors usually pay several hundred dollars a month for the arrangement. But much of the time, Pruner said, what cart operators pay for is not the actual use of the facilities, but the signature on a log-in sheet “certifying” that the vendor has visited the commissary every morning before opening and every night after closing. This rarely happens, Pruner contends, and Mark Myer, food and lodging supervisor of Durham County Health Department, confirmed that this probably is the case. Pruner said the rule was not set up to ensure food safety, but rather to establish a costly barrier that discourages mobile food vendors from operating. Pruner said he looked into getting a commissary agreement before he opened his hot dog business, but was unable to find a restaurant willing to host him. “We looked into building a commissary ourselves and renting it out, but you have to put in sinks and freezers … it’s quite a bit more money than a hot dog cart,” he said. In December, after being thrown in jail twice and shut down on the threat of arrest on two other occasions, Pruner saw an ad on Craigslist for an opening at a commissary. The commissary owner, Anthony Hill, also owns Mama Jean’s BBQ Shack, a 14-foot trailer on wheels. Hill bought the commissary for the express purpose of opening his mobile catering unit. Although Hill plans eventually to turn his brick-and-mortar location into a full-service restaurant, now he does all of his business from the trailer. Pruner said buying a restaurant or commissary to open a mobile food unit defeats the whole purpose of entering into a low-capital venture. He said Hill’s business seems to be the only one in Durham willing to offer commissary services. The only other location Pruner could find was Carolina Commissary in Raleigh, which charges $300 a month. Hill charges less, and is located in Durham. Pruner said four or five Durham hot dog vendors use Mama Jean’s as their home base, and he hasn’t noticed more than four or five vendors operating in the area. In Hill’s advertisement, he says the health department recently gave him permission to take on several more mobile food vendors. He’ll be fighting misdemeanor charges for operating without a license in a Durham County District Court Jan. 5. If he loses, he plans to appeal.